Our partner Experian calculates monthly insolvency risk scores for most scheme employers. Experian calculates scores by using the data that the online Pensions Regulator's Exchange system has on your scheme, along with your recent company accounts, which are filed at Companies House or overseas registries. If your scheme employer does not file with these registries or other 'permitted sources' you can voluntarily submit data. We collect credit ratings information on the first working day of the month, reflecting the position at the end of the previous month. This information is collected from three selected rating agencies – Standard and Poor’s (S&P), Moody’s and Fitch. This is then used to calculate the score at the end of the month in which they are collected. Some financial services businesses, which don’t have a credit rating, are scored using the S&P credit model. 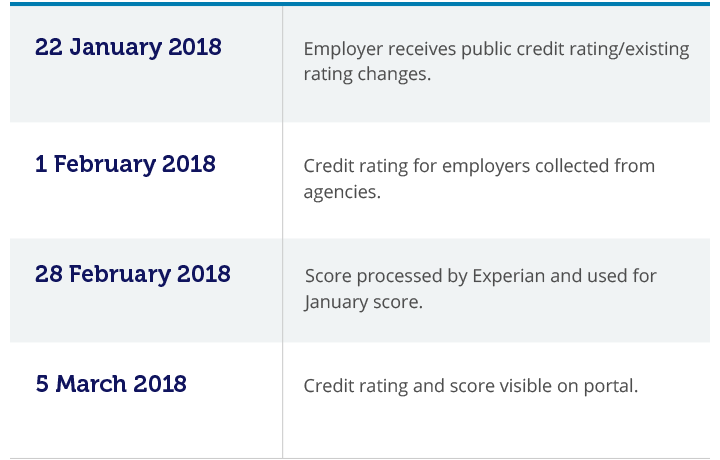 We provide Experian with the credit ratings information and scores are updated by the end of the following month. Three scorecards include a mortgage age variable that uses charge information from Companies House. In limited circumstances, information about certain types of charges can be provided to Experian and these are disregarded when this part of the score is calculated. If the calculation of a change variable - measuring the change in a data item over time - would otherwise rely on data at two different times on different accounting bases, Experian may accept certificates and adjust the calculation if these are provided by 31 March. Three of the scorecards include variables that use employee numbers. If the information is received and accepted by Experian by the end of March; in calculating the monthly scores, they’ll backdate the revised calculation to the date when the most recent accounts were filed. Where there are change variables, and where both types of accounts are recording an identical value for the past year (N-3) because any subsidiary companies consolidated are dormant, schemes can notify Experian by 31 March 2019 and if accepted Experian will override any “unknown” scores previously calculated. Where it is clear in the relevant accounts that the status of any subsidiaries is dormant and that the variable values are identical on a consolidated or non-consolidated basis this can be done by the employer notifying Experian (enclosing suitably marked up accounts). Where it is not clear, the employer’s auditor will need to provide confirmation of these requirements.